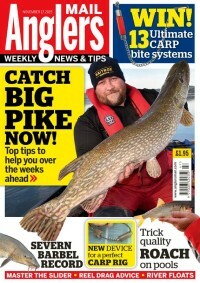 January is quickly becoming my favourite month of the year, especially for pike fishing! Which is a bonkers thing to say! But not only do I like the generally cold crispness of the frosty mornings during this time, I have over a few trips also caught a fair few pike! 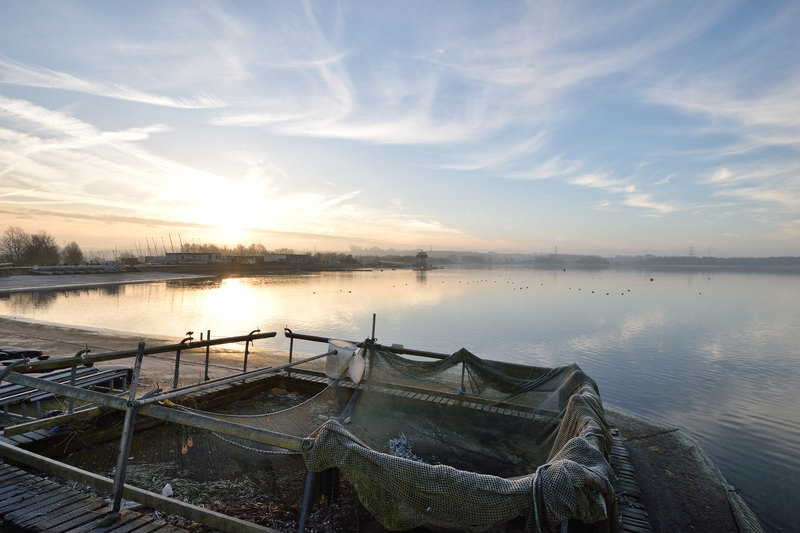 I think it is fair to say that for most anglers January is a tough time of year, and it used to be a scratching time for me as well, but, over the last few years, I have worked out a few key things that have increased my catch rate at this time of year significantly. 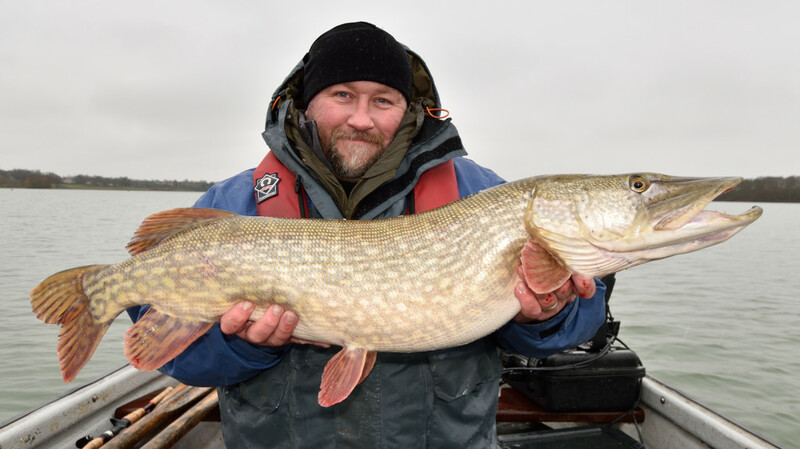 The first mistake I think that most anglers make is to assume that pike won’t respond to lures at this time of year, when really the opposite is true. 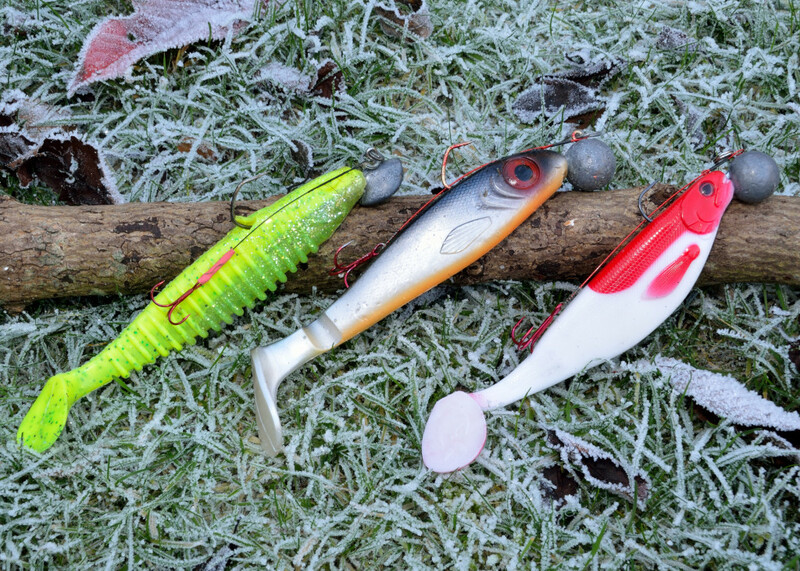 In my experience if the water temperature drops below 4 degrees, which is typical at this time of year, the pike really switch off from “hunting mode” and so won’t chase or move around that much for food, which is why you struggle with traditional deadbaiting tactics when it is like this. Yes, it’s nice and comfortable to be sat behind a couple of rods with the umbrella up, but if you want to catch pike, get the lures out! If only it was as easy as that, you need the right lures and, just as importantly, you need to know how to fish them correctly, which means close to the bottom and very slowly. 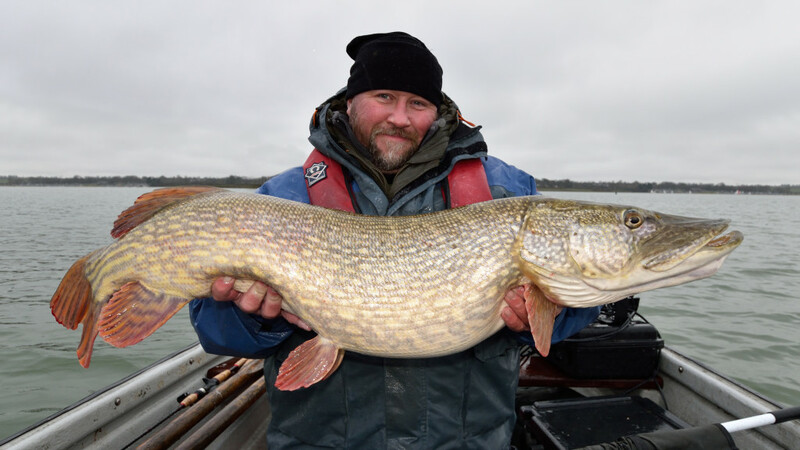 Pike, even semi-dormant ones, still have the instinct to look at, or interact with, anything that is near it if you put it right on top of them, and if you can keep the lure working near them for long enough sometimes they will nip at it. At this time of year, a pike nipping at your lure is the best you are likely to get, so you need to rig them correctly with the appropriate stingers and most importantly use the right gear so you can actually feel the gentle takes. This is no place for stiff rods and replicants! I use Greys Specialist pro rods in 80g casting weight using a nice compact Revo MGX reel and 40lb whiplash braid. I think the multiplier is important as you keep direct feel with rod and the braid far more so than with a fixed spool, in my experience. What I aim to do is fish the lure as close to the bottom as possible, but without actually touching it, so that means counting it down then working out the drop- and- retrieve rate. You need to be using the correct size jig head, it needed to be big enough so when you slow down or stop winding it will still have enough weight to pull the lure through the water and get working on the pendulum back to the boat or bank. 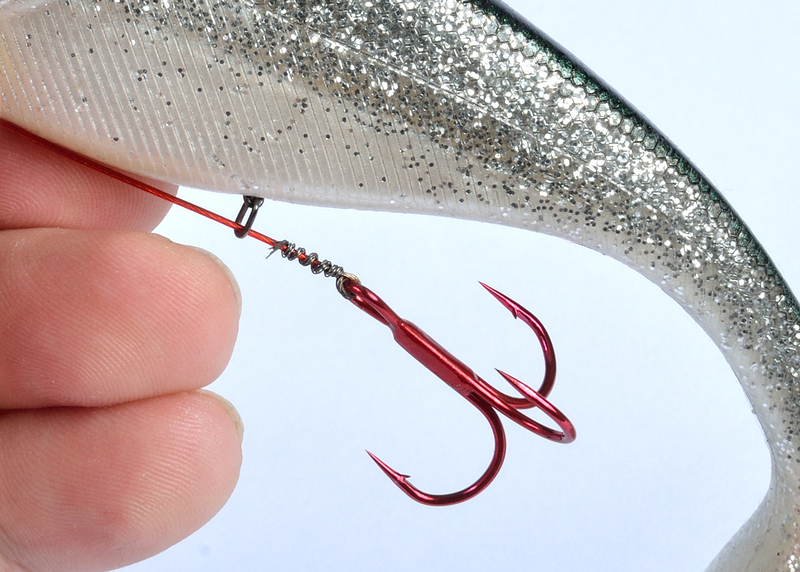 It sounds very complex and it is, there is a definite knack to it and it’s hard work to concentrate for a full day, but the results are certainly worth it, and it’s a technique I am looking forward to giving a try on Chew – once the fish become full up on deadbaits. The best thing about January is that the fish are fat and chunky, none of those long lean 20lbers that you catch in September, at this time of year they can be as fat as barrels, and your chances of a special fish are greatly increased. I’ve been very lucky with “specials” this season so you can imagine my surprise at catching another one! I was out on one of my increasing rare days off, the forecast was for a lovely cold but sunny day with light winds, ideal for what I wanted to do. However I woke up to snow, then when I got the lake it had turned to heavy rain! Lovely! The light wind also turned out to be 15 – 18 mph and it was freezing! Absolutely pants conditions, or so I thought! On getting out I quickly found a couple of fish using the sounder and had both of them fairly quickly, but, alas, they were not very big, so I went searching for some bigger ones, but it wasn’t until midday (after two costume changes due to the rain) that I finally found what looked like a decent fish on the finder, and moved off up-wind to anchor up and cast at it. 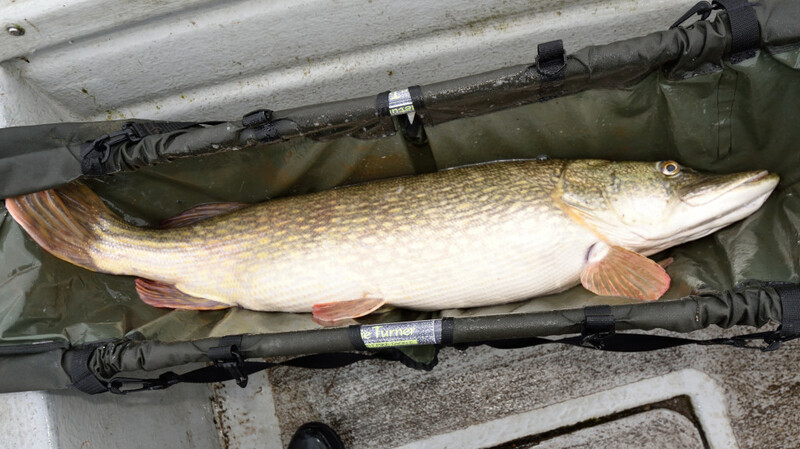 Half an hour creeping lures along the bottom, and a gentle thud on the braid, was all that indicated a 23lber was nipping at the lure – a quick strike, and after a lacklustre fight she was resting in the net by the side boat ready to be photographed. This was easier said than done as self- takes in the rain are difficult enough, when it’s snowing it’s even harder. I was also panicking as the battery indicator was flashing red on my camera, possibly due to the cold, and when I swapped batteries the second one was flat! But I managed to get a couple of quick snaps and put the fish back, and went back to look for another one to cast at. This didn’t take long, as slightly further along the same depth contour I found another fish that looked at first glance to be around the same size. It was the same procedure, quietly move off and anchor up, and proceed to present a variety of lures as close as possible to the almost static target. Except it didn’t take more than two casts when “Bang”, something really hit the lure, and on a tight line started to pull the boat around on the anchor rope like only a really big fish can do. Moving around the boat in three layers of wet clothing is difficult, more so when you are trying to keep a tight line on a big fish. But I managed to get it under control and soon it was coming up under the boat and then “Bang”, it shot up and wacked itself against the bottom of the boat. I reached around to grab the net, and scooped it up as it lay there with a stunned look on its face. Safely in the Sladle I could see that she was a true monster, and she had really gobbed the lure- which isn’t a problem when you have cutters with you, and a couple of snips and the points were out. The scales told a great story, as not only was she going to be my third 30+ of the season, she was also my new PB for the venue. One that will take some beating! Even better than all that, I had wisely kept my camera battery in my pocket to try and warm it up, and I managed to get a couple of decent photos of her before my camera finally died! After a fish like that the long four hour journey back didn’t seem to take so long, and more importantly with the outside temperature dropping to -3 degrees – the heated seats in my car felt lovely! I sat there quite smugly thinking that most anglers wouldn’t have even ventured out on a day like that, and sometimes you do get rewarded for putting the effort in.